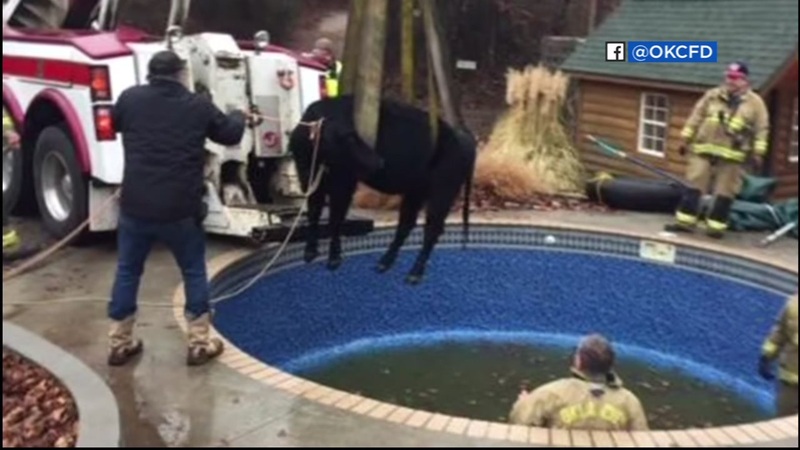 OKLAHOMA CITY (KGO) -- Crews had to remove a cow after it got stuck inside of a pool in the backyard of a home in Oklahoma City. The homeowner went out to investigate a snorting sound coming from the yard and found a 1,500 pound farm animal inside of his pool. Its head was above the water, but animal control was concerned that the cow would get hypothermia. Firefighters removed about 5 feet of water from the pool with a pump, then they used a tow truck to pull the cow out. Officials say the cow never seemed to be in distress and should be just fine.